The lion in Romanesque art, meaning or decoration? 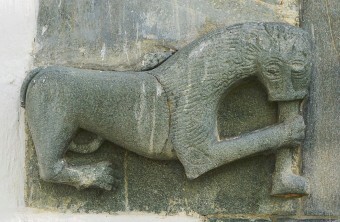 Even in Scandinavia, the lion is the most common predator in Romanesque church decoration. It is found in sculpture and mural paintings as well as in holy books, on church textiles and metalwork. This article discusses the symbolic meaning of all these lions and addresses the question of whether they can be attributed meaning or if they are to be considered simple decoration. Based on the Bible, the Bestiaries and a small selection of other written sources, the literary meaning of the lion in medieval culture is investigated. A wide spectrum of qualities is disclosed. Most are positive or even God-like, but there are also sources referring to the lion as a symbol of evil. This seemingly double character has been used as an argument against ascribing meaning to the image of the lion when outside an unambiguous context. The basis for all interpretations is the natural characteristics of the lion: strength, courage, stately appearance and noble character. From these, as well as some mythic characteristics a wide variety of roles for the lion have developed. 12 distinct roles can be clearly identified from the written sources and the Romanesque pictorial tradition. Nine of them are undoubtedly positive from a Christian point of view, while two are ambiguous and only the satanic lions are clearly negative. The potential meaning of the 18 lions or lion-like sculptures at Værnes church (1120-1160) is discussed. They are all placed close to external portals or other openings or at the end of roof beams in the interior. These all belong to the liminal zones of the church building. This gives them a general role as guardian lions, even if some of them also play other roles or lack attributes which makes them easy to interpret individually. Even if distinct roles can be identified, many of the sculpted or painted lions represent several roles at the same time. Some lions are also placed in ornamental contexts where there is good reason to argue that their main purpose is decorative. That does not mean that these lions did not also convey meaning to the medieval recipient. The idea of an unambiguous answer to the riddle of traditional iconography is just too narrow to fathom the many aspects of the lion. This article argues that even when aggressive, the lion is normally in the service of God, punishing the sinner. This as well as the constancy of the lion as symbol of strength, speaks for a general significance of the lion for the medieval viewer. Fig. 1. Characteristics of the lion according to the bestiaries. The Oxford Bestiary, Bodleian library Oxford, MS Ashmole 1511, ca 1210. Photo after Mariño 1996, 141. 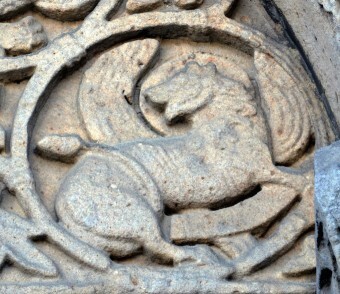 The lion is one of the most common figurative motifs in Romanesque religious art. Its image is reproduced in all materials: stone, wood, brass, paint and books. The context also vary greatly, the lion is found in all parts of the church building, on different liturgical objects, as well as in manuscripts from the full page to the margins. An influential monument as Lund cathedral has a total of more than 80 Romanesque lions in stone. In Scandinavia the lion is strongly associated with the Christian culture that took hold from the 10th century on. Even if lion-like figures are found in early Scandinavian art, it is one of the motifs that gained more widespread use with the new cult. Not only did it dominate religious art, the lion also found its way into the coats of arms of the royal families of Norway, Denmark and Sweden. The textual interpretations of the lion spans from a picture of Christ to the Devil himself. This rather complex situation has made many researchers reluctant to ascribe iconographic meaning to the lion. The argument is that the motif is too diverse to interpret and it is thus reduced to decoration. This article will present the many facets of the lion and single out the common denominators to look for consistent meaning in the many images. The main argument is that the lion has some constant qualities which in most cases make it relevant to discuss its meaning. As a short article does not allow for the number of illustrations necessary to allow the pictorial material to form its backbone, the choice has been to base the argument mainly on the written sources and reduce the images to illustrations, even though the point of departure for the article is indeed the images. All the pictorial traditions that are discussed in this paper are found in Scandinavian Romanesque art, but some of the illustrations are later or from other countries. In some cases this is for practical reasons, in other cases illustrations accompanied by instructive texts are chosen to link the images to the written sources. When the lion motif came to Scandinavia where no physical lions were known, it was embedded with meaning. To probe beneath all these different and sometimes apparently conflicting meanings, it is necessary to go to the Bible and the Bestiaries, which are the two most relevant written sources on the aspects of the lion in theological thinking. The next step will be to go through the different roles the lion plays in medieval Christian art, singling out 12 distinct functions. Finally, the question of meaning versus decoration will be discussed, using the church of Værnes, Nord Trøndelag as a case study. Traditionally art historical research has been dominated by the iconographical practice of matching motifs with written sources. This is one of the reasons that the diverse Romanesque figural art has to a great degree been written off as decorative, not carrying meaning. 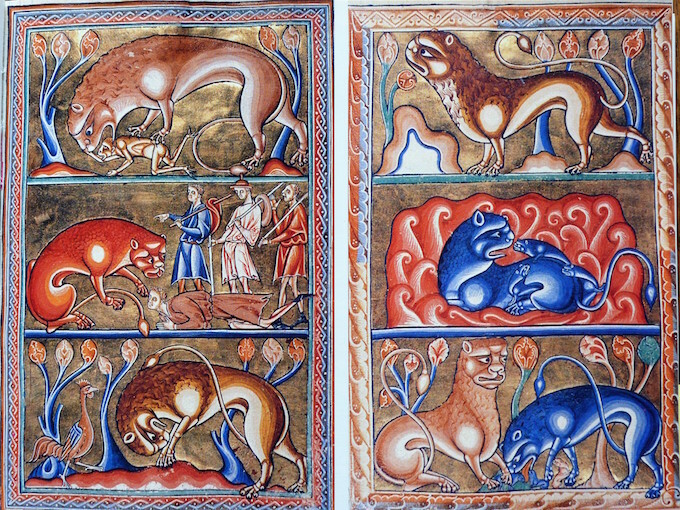 Those who have approached the lion to look for a basis of interpretation have often started off with the Bestiary, a medieval literary tradition based on a continuity from Antiquity. Many Bestiaries were illuminated and thus constitute a direct link between word and picture. The Bestiary has its own research history, with several authors looking for imprints in the pictorial arts, beyond the illuminations. To the degree older researchers like the French art historian Émile Mâle (1862-1954) worked with non-narrative motifs, it was with the aim to find a textual basis for interpretation. The comprehensive articles on the lion in the Encyclopedia on Nordic Medieval Cultural History discuss the lion as a motif in writing and art in the iconographic tradition. Its many roles are highlighted and in the chapter on iconography Martin Blindheim (1916-2009) presents the iconographical types, touches upon a presumed apotropaic function only to conclude: “In the great majority of cases however, the lion is part of a common European ornamental treasure wherever it is placed; on portals, benches, boxes, knife sheaths or in illuminated manuscripts etc.”. The art historian Michael Camille (1958-2002) changed the focus of research to the margins, to investigate the interplay between marginal and central motifs. Such a wider contextual approach has proven fruitful and has provided a basis for reading non-literary motifs as well. 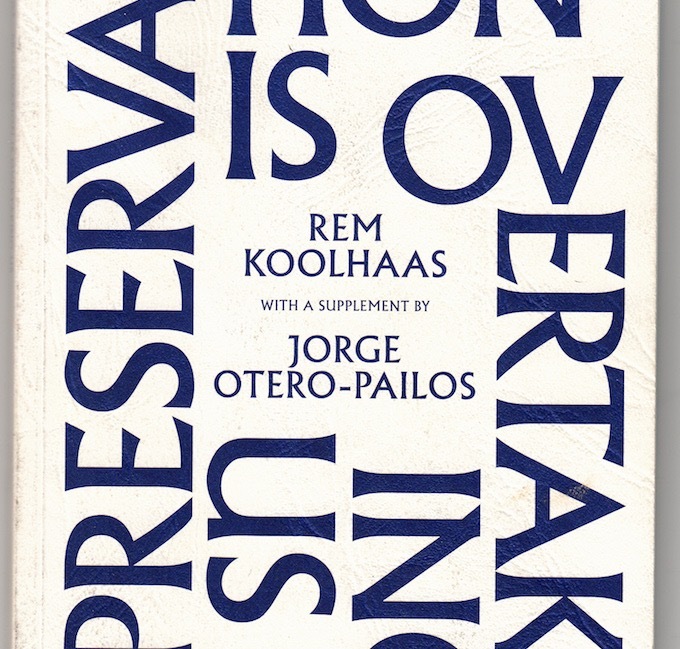 This approach opens up for a reading beyond the traditional iconography, without discarding the results of iconography. This study argues for an open reading as discussed by Elisabeth Sears. This involves a close visual analysis, informed by a knowledge of the special historical context with the aim of gaining an understanding of the possible intentions and contemporary interpretations of the object. However, the method of the article is rather to present representative examples of the different motifs and establish them as typos on the basis of a pictorial tradition, supported with literary evidence where possible. The intention is to inspire use of these categories as help to uncover the possible meanings of the thousands of Romanesque lions still to be encountered in the most unexpected places. A brief case study of the lions in Værnes church is an attempt to show how this approach can be put to use. From the introduction, it would seem obvious that this article will argue for the lion motif in general, carrying a meaning far beyond the merely decorative. The aim is to present the lion as a prime example of a many faceted motif where several interpretations often will be relevant. The roots of lion as a symbol can be traced back to the Old Testament and the other ancient civilizations of the Eastern Mediterranean. The remote and ancient roots of the motif have been used as an argument for the lion as a pictorial convention that was imported to Christian culture as pure form borrowed from Oriental art. Émile Mâle argued that the lion in Romanesque church decoration was an ornamental loan: “Our sculptors were not always concerned with teaching; most of the time they thought only to decorate.” He continues to argue that many of the animal motifs, and prominent among them most lions, were borrowed from Eastern textile art, which was well known in medieval Europe. For instance, the pair of lions flanking a tree denotes the tree of life or the tree of truth: not Biblical trees but the ancient myths of the Chaldean culture. In Mâle’s opinion those motifs have travelled as empty forms and were adopted by the medieval artists when they saw the fantastic and inspiring textiles that were imported in particularly large numbers after the crusades. Mâle does not seem to have considered whether meaning traveled along with the motifs. The continuity of the myths of the trees of truth and life are examples that are very close at hand. The question is whether the dichotomy between meaning or decoration is relevant. Of course decoration was intended but that does not exclude that the motifs were charged with meaning at the same time. When read closely, Bernhard’s critique is aimed at the use of the imaginative pictures in a monastic environment. However, in churches decorations are appropriate as beautification of the house of the Lord. At least it will not harm the “simple and devout”. He does not emphasize the potential of the pictures for their teaching, but when arguing against the use in monasteries says: “…is more pleasant to read than the books”. In other words, it is natural to Bernard that images are objects to be read. Whatever belongs to the liturgical offices, objects, and furnishings of the Church is full of signs of the divine and the sacred mysteries, and each of them overflows with a celestial sweetness when it is encountered by a diligent observer who can extract honey from rock and oil from the stoniest ground. In other words, everything ecclesiastical can be used as means of teaching; everything carries meaning when read in the right way. This post-Romanesque but still relevant attitude towards church art opens for many readings and offers good support in the search for meaning in the lion motif. Ca 70 verses and a total of 140 references with the word “lion”, makes it the most common wild animal in the Bible. More than 90 per cent of the quotes are in the Old Testament and in general offer a rather realistic picture of the Lion. The texts were written by men who had first-hand experience of the frightening and dangerous predator. The following quotes are a representative selection of different uses of the lion in the Biblical texts. When the Biblical quotations are read as a totality it becomes clear that the fierce and violent lion, found in all these allegories, is used neutrally concerning the antagonism between good and evil. The lion is a simple picture of powerful strength. The lion is likened both to the just cause of the Jews and to God, as well as to the threatening Devil. In the great majority of cases the lion is either likened to God or his people, or serves him by punishing the unjust. Leo the Lion, mightiest of beasts, will stand up to anybody. …‘leon’ has also been translated as ‘king’ from Greek into Latin, owing to the fact that he is the Prince of All Animals. …. Scientists say that Leo has three principal characteristics. His ﬁrst feature is that he loves to saunter on the tops of mountains. Then, if he should happen to be pursued by hunting men, the smell of the hunters reaches up to him, and he disguises his spoor behind him with his tail. Thus the sportsmen cannot track him. It was in this way that our Savior…once hid the spoor of his love in the high places, until, being sent by the Father, he came down into the womb of the Virgin Mary and saved the human race which had perished. The Lion’s second feature is, that when he sleeps, he seems to keep his eyes open. In this very way, Our Lord also, while sleeping in the body, was buried after being cruciﬁed—yet his Godhead was awake. The third feature is this, that when a lioness gives birth to her cubs, she brings them forth dead and lays them up lifeless for three days—until their father, coming on the third day, breathes in their faces and makes them alive. All the qualities of the lion in the Bestiary are either positive or morally neutral. It does not directly present the lion as a picture of Christ, but draws several parallels between the characteristics of the lion and Christ. The lion is first and foremost strong and mighty and able to kill, but restrains himself and does not kill without good reason. There are no references to diabolic sides to the lion. What the Bestiary does however is to demonstrate the rich associations embedded in the image of the lion to the medieval mind. Based on the texts from the Bible and the Bestiaries it is possible to determine some common features of the lion. The lion is the prince of the animals through its strength, courage, stately appearance and noble character. The lion is fair and does not harm the just, except when very hungry. It is a fierce animal and when it attacks, it is very dangerous. Only the strongest of men can defeat the lion. The question is therefore not if the lion is evil or good. That depends on the position of its counterpart. The essence of the lion is its strength. A review of the substantial material on Romanesque lion depictions makes it clear that even if most of the qualities of the lion are universal, the roles of the lion are very diverse. Based on written sources and established pictorial traditions it is possible to define at least 12 distinct roles played by the lion. In some cases a single role is clear cut and easy to identify, often more roles are present in one representation. Fig. 2. Royal coat of arms of Norway. 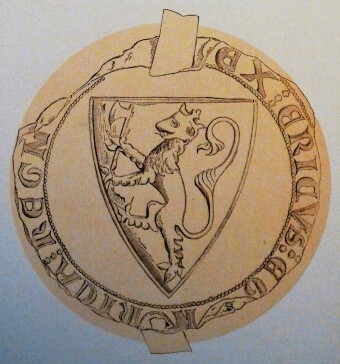 King Erik II Magnussons seal 1285 (Huitfeldt-Kaas, H.J. Norske Sigiller fra middelalderen. Kongelige og fyrstelige segl. Kristiania 1924. pl VIII) Original in Riksarkivet. The king also made a great ivory throne and overlaid it with the finest gold. The throne had six steps, and the throne had a round top and on each side of the seat were armrests and two lions standing beside the armrests, while twelve lions stood there, one on each end of a step on the six steps. The lion carrying or flanking throne chairs has since become a convention which can be seen both on royal thrones and the thrones of saints and bishops. The lion is the most used heraldic animal together with the eagle. Four of the Nordic countries still have the lion in the National Coat of Arms. The roots of this use however goes back to the coats of arms of the medieval Royal families, established in the 12th century. Fig. 3. The royal lion. 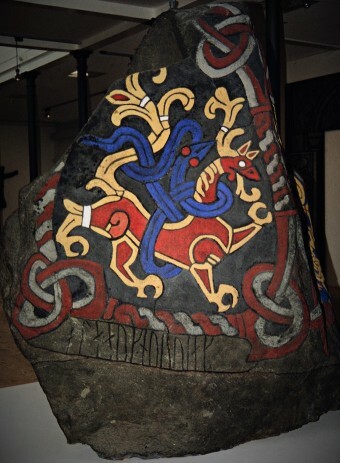 The Jelling stone, ca 965. After coloured replica. Photo: Morten Stige. The lion as a representation of God is found in a Norse textual source from ca 1200: Old Norwegian Homily book. The sermon on the day of St John the Evangelist states that the four beings not only symbolize the four evangelists, they can also represent the Lord himself. Based on St John’s Revelations as quoted above, Christ is described as “the Lion of the Tribe of Judea”. This allegory associates the Majestic lion to Christ the King, one of Christ’s central roles. The lion as a parallel symbol of the King and Christ gives a meaningful interpretation of the Danish Jelling stone (c 965) pointed out by art historian Signe Horn Fuglesang: The key monument of the Christianization of Denmark represents both the earthly and the heavenly ruler. Fig. 4. Guardian lions. 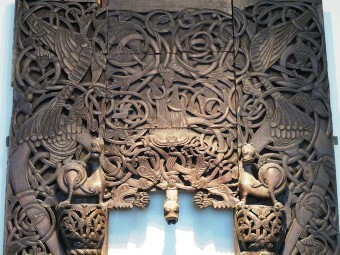 Western portal, Ål stave church, ca 1150, Kulturhistorisk museum, Oslo. Photo: Morten Stige. A large proportion of the lions in Romanesque ecclesiastical art are guardians of the church, often constituting part of the architectural sculpture of the portal. Either as a round sculpture flanking and often carrying the portal as is common in Italy, or as reliefs on tympanums or jambs. The lions in that pose can be found on many Scandinavian stone churches while a variant developed on the Norwegian stave churches. Lion heads are often found integrated in the carved reliefs of fighting dragons on the jambs, while lions sculpted in the round are found on the capitals flanking the portal opening. Art historian Erla Hohler describes this type as “the guardian capital lion”, however she sees it as an adoption of a foreign convention, void of meaning. There is however, all reason to assume that the lion’s qualities as a guardian was obvious also to the Norse viewer. Not only is it powerful and frightening and thus able to discourage potential attackers. According to the Bestiary, it also has the quality of sleeping with open eyes. 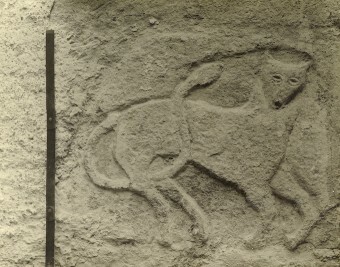 In addition, it has been argued that the lion has an apotropaic effect. A closer look at the lions in the context of the portal reveals that some are aggressive and some seemingly peaceful. This is especially evident where the lion is represented together with a human being or another animal as on many of the Romanesque Italian portals. Often the impression of the lion as a dominator is confirmed, for instance when there are claw marks on the back of the underlying man. On the other hand the posture of the guardian lion in the cathedral of Ferrara, Emilia-Romagna, is clearly protective towards the underlying sheep. This relationship will be discussed later, but the general point is that the relation to the accompanying figure does not affect the understanding of the function as a gatekeeper. Fig. 5. Supporting lions carrying the baptismal font. St Mary’s church, Stafford. Photo after Bond 1908, 110. Often the Romanesque lion can be seen supporting objects of physical or symbolical weight. Thrones have already been mentioned, other such objects are baptismal fonts, pulpits, the pillars of the church portal or even the church building itself. Art historian Frans Carlson has made a convincing argument, explaining much of the figurative Romanesque building sculpture as supporting the church: concretely bearing the church building, symbolically supporting the church as an institution. The lion is one of the central motifs in the architectural sculpture that is included in his argument, as supporters of ecclesia universalis. Often these lions also function in the role as guards. One example is the baptismal font of St. Mary’s Church, Stafford, England. Two lions support the basin of the font and a text on the rim states: “He is unwise who does not flee from these lions.” The lions both carry the font and guard the holy baptismal water. Fig 6. The punishing lion. Chancel portal, Værnes church, Nord Trøndelag, ca 1140. Photo: Morten Stige. Sometimes the strength and fierceness of the lion is not only shown as a potential, but the lion is shown in the act of attacking an opponent or even devouring a man. These aggressive lions make up a relatively small proportion of the total number of representations but are important as they highlight some of the lion’s most significant characteristics. As shown, the Bible and other theological sources give many examples of how these frightening qualities of the lion are used to describe the danger of disobedience to God as well as association with the Devil. However the lion is not diabolic in the sense that he leads people into sin. When found attacking a person we can normally rest assured that the victim of his rage is not innocent. The prey is a sinner who deserves his punishment. Thus, the lion is basically a tool of justice, not of the Devil. 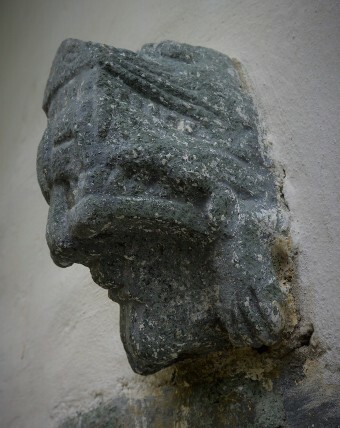 It is this “Janitor of Justice” which swallows the leg on the portal of Værnes church, Nord Trøndelag. An interesting nuance of this role is the lion on a late 12th-century capital in the Bode Museum in Berlin. The lion spews out his human prey on the Day of Judgement, to deliver his victim to his final sentence by God himself. Fig 7. The merciful lion. Tympanum above western portal, Jaca cathedral, Aragon, ca 1100. Photo after Carlsson 1976, fig 150. One of the characteristics of the lion according to the Bestiary is that he will spare the man who prostrates himself. If this rather unrealistic quality of the lion was not added to his myth he would not be as useful as a servant of good. This quality makes it clear that the devout and humble have nothing to fear from the terrible lion. Daniel in the lion’s den is one prominent example. The just Daniel is saved but his unjust persecutors are devoured by the same lions, as soon as the cards are turned. 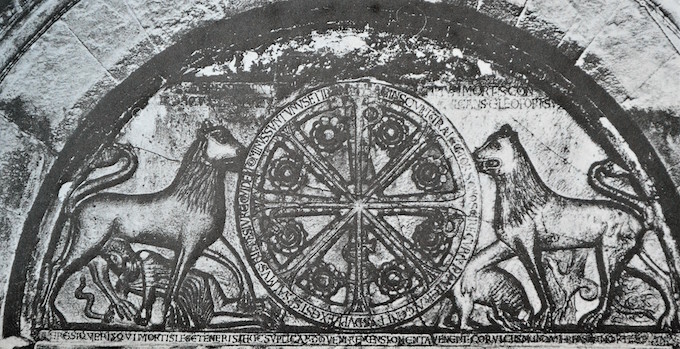 On the tympanum of the cathedral of Jaca, Aragon an inscription removes all doubt about the relation between the two lions and a man and beast kneeling down for the lions. The text above the lion to the left reads: “The lion knows to spare he who prostrates himself, as Christ forgives he who prays”. The inscription above the other lion reads: “The mighty lion destroys the empire of death”. This image sheds light on the relationship between the guardian lions and their companions discussed above, and shows that the lions will indeed protect those who seek protection. The second text refers to the next role of the lion: as a symbol of resurrection. In the normal situation where there is no inscription to aid interpretation, we can expect the lion to be protective towards typical sacrificial animals like the lamb or a pious human, while it will act aggressively towards strong beings such as bears, dragons or snakes, or sinful human beings. Fig 8. The lion of resurrection waking his cubs to life at the third day. The motif is appropriate on the crucifix. St Nicholas church, Stralsund. Photo: Morten Stige. The lion as a symbol of resurrection is based on a mythical quality conveyed by the Bestiaries and was adopted by the theologian Honorius of Autun (1080-1154) in his collection of sermons. The lioness gives birth to dead cubs, who are brought to life when the father either breathes or roars at them on their third day. This God-like feature of the lion gives it a strong symbolic meaning as an agent of eternal life. As we saw in Jaca the lion is thought of as a victor over death. That can only be through his role as resurrector. The motif of the lion breathing on his cubs is found on several Scandinavian wall paintings, but to the author’s knowledge not on any fonts. Still this aspect is probably the key to the interpretation of the countless lions who inhabit Romanesque baptismal fonts. Baptism is seen as a second birth. When confronted with monkeys and rams as at the font of St. Mary’s, Stafford his role of exterminating sin and at the same time giving new life through Christ, depicts the full process of a rebirth. Fig 9. The loyal lion of Le Chevalier au Lion on church door in Iceland National Museum, Valþjófsstaður kirke, Iceland, ca 1200. Photo: Hans Reich, after Kristján Eldjárn: Gammal konst på Island, 1957, fig 12. The most common example of the loyal lion in church art is as the companion of St. Jerome. The church father relieved the lion of a thorn in its paw, which made it his most loyal companion for the rest of his life. The lion is often depicted resting peacefully while St Jerome is at his desk writing. The grateful and loyal lion was also a popular theme in the medieval romances. He is a main character in Le Chevalier au Lion by the author Chrétien de Troyes, written around 1180. The key scenes from that romance are the motifs on the richly carved church door of Valþjófsstaður on Iceland, c 1200. Fig 10. The defeated lion: David rescuing the lamb from the lion’s mouth. Wind vane, Tingelstad church, Oppland. Now in Kulturhistorisk Museum, Oslo. Photo: Morten Stige. An interesting situation occurs when the strong and normally invincible lion is defeated by someone. That is the ultimate proof that someone is no ordinary person. Defeating a lion is reserved for figures like Hercules, David and Samson. When seen in Christian art it is most often one of the two latter who is the lion slayer. Both motifs are found in several versions in Scandinavian medieval art. The lion hunt is another version of the same theme. 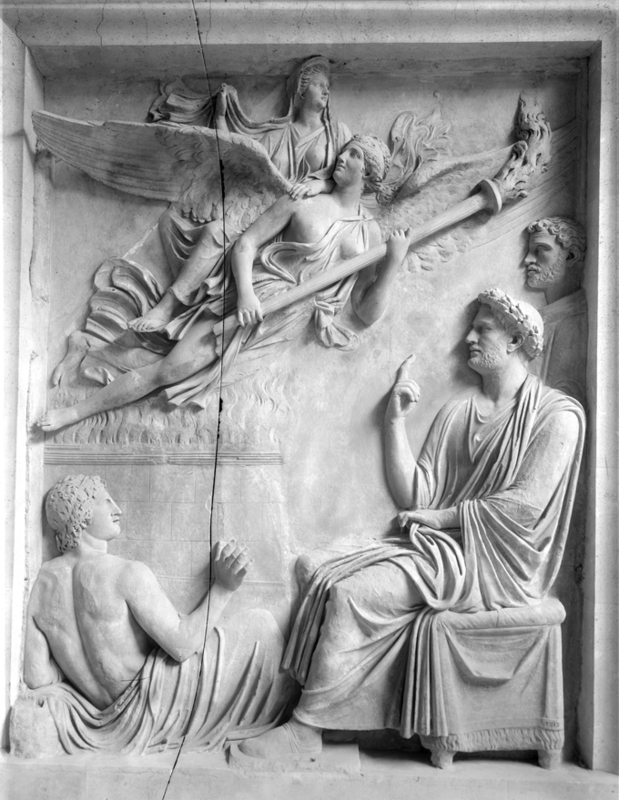 The motif was common on Roman sarcophagi. It shows what is considered the most aristocratic hunt, reserved for kings and noblemen. One interpretation is that the defeated lion symbolizes man’s triumph over death. 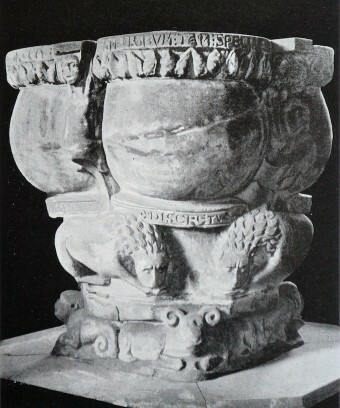 The font in Munkbrarup, Syd Schleswig shows a Romanesque version of the ancient motif. Even when defeated the lion stand out as a symbol of strength through the valor of his adversaries. Adversely the power of his vanquishers is highlighted through the act of killing the lion. In the same way, one aspect of a lion under the foot of St. Mary or other saints is to show the power of the saint, while the trampling on the Devil is the most common modern interpretation. Both are relevant. It may be a parallel to the male heroes defeating the lion with raw power, showing that through the strength of God a feeble woman can also dominate the strongest. Fig. 11. Leo as part of a zodiac program. Portal. Sem Church, Vestfold. 12th century. Photo: Riksantikvaren. The zodiac has its roots in Babylonia, but was adopted by both the Greeks and the Romans and was therefore a natural part of the pictorial language of the first Christians. Leo stems from the star constellation of that name. It is a fire sign and his month is in high summer when the sun is fierce. Leo is a sign of masculinity and energy. The lion’s strength is once more the key, but an added aspect is the lion as a symbol of the Sun. In Christian art Leo may be found on his own or associated with summer tasks. Either way he is part of a representation of the cycle of the year. The motif is not very common in Scandinavia, but Sem church, Vestfold has some of the signs as reliefs on one of its portals and the Zodiac is found in frescos in Hvorslev church, Viborg amt (1175-1200). Fig. 12. The winged lion of St Mark. Tympanum, Lund cathedral, 12th century. Photo: Annette Landen. The lion as symbol of St. Mark the evangelist is normally easily distinguished as he is winged and often caries a book or a scroll. The motif is found in Scandinavia all through the Middle Ages, but commonly together with the three other Evangelist symbols. The Old Norwegian Homily Book explains why the lion is the sign of St Mark. He is the evangelist most concerned with the Lord’s resurrection, and as the Homily continues, the lion is a symbol of the resurrection through its way of giving life to the cubs on the third day. Once more we see how the different meanings attributed to the lion overlap. The symbols of the evangelists are also parallels to the four living creatures of the Revelation: “The first living creature like a lion, the second living creature like an ox, the third living creature with the face of a man, and the fourth living creature like an eagle in flight”. 1 Peter 5:8 is often cited and is the main basis for a common opinion in much art historical literature from the 19th century on, that the lion can regularly be interpreted as a representation of the Devil. Several of the other Bible verses cited above also use the fierce lion as a warning to be vigilant against evil. As argued above, Peter uses the lion as a likeness for Satan’s dangerous power. It is a strong warning illustrated by the lion’s well known characteristics. Fig. 13. The satanic lion. The devil of Oslo; sinner flanked by a lion and a dragon. Corner stone, St. Hallvard Cathedral, Oslo. Now on Oslo Cathedral. 12th century. Photo: Morten Stige. When the lion is operating alone, aggressiveness towards the sinner may be seen as the work of God as much as an act of the Devil. However when the lion is coupled with the dragon in pursuit of a man, it is natural to associate their work with the Devil. The dragon is never a positive force in Christian art, and so the lion is degraded by his company. 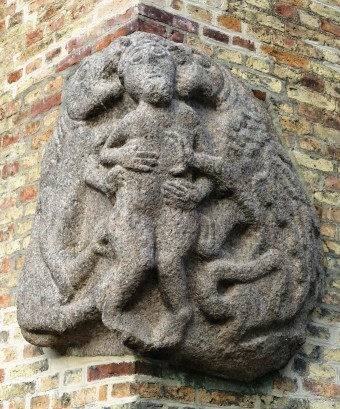 An example of this is the so called, Devil from Oslo, from the 12th-century St Hallvard Cathedral. In this case the popular name probably corresponds with the medieval intention. Few of the references to the fierce lion in medieval literature conclusively equate the animal and the Devil. However St. Augustine (354-430) says in one of his sermons that while the bear has its strength in the claws and the lion in its jaws, these two animals constitute the image of the Devil. Pairings of lions and bears are not very common but many images of lions are open to interpretation. Many a priest will have preached about the diabolic lion through the centuries, as well as many art historians. 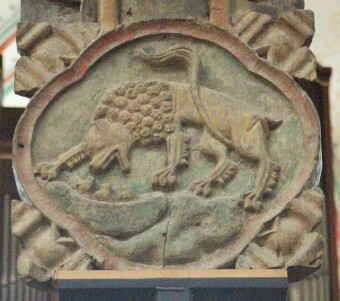 The lion as a representation of the Devil is a relevant interpretation in some cases, but is not the general role of the lion in Romanesque art. A close and careful reading is necessary to decide which role the lion is playing in each case, and due to the complex interplay between God and the Devil the answer is often not straightforward. Fig. 14. Værnes church, Nord Trøndelag. Tympanum of North portal. Photo: Morten Stige. 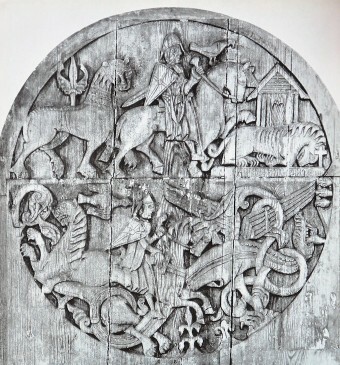 To show how the lion was adopted and put to use in Scandinavian 12th-century church art, the great variety of lion motifs in Værnes church, Nord Trøndelag, offers a suitable case for study. The lion is the most common motif in the sculpture of the church. Only on the roof beams are other motifs also found. Two out of three portals are decorated with sculpted lions and probably the third portal had lions as well. 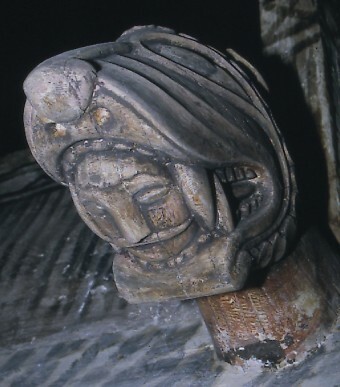 Several lion heads are found at the ends of the roof beams in the interior. In total around 18 lions decorate the church. Six are carved in stone and a dozen carved in wood. Lions are the only figurative motifs in stone, while the wooden lions have rather varied company, being part of a suite of 39 preserved beam stops, out of 40. The most striking fact is that the master behind the architecturally rich church of Værnes chose the lion as the only external, figurative decoration (Fig. 14). Could the lion convey all the messages desired, or was the only aim to show beautiful craftsmanship, equating the lions to the star ornaments and profiles? Fig. 15. Værnes church, Nord Trøndelag. Fragment, probably from South portal. Photo: Morten Stige. First of all it is essential to note that most of the lions are preserved in their original position. The only exception being a group of protruding heads flashing their teeth that now flank a window high up on the southern wall of the nave. Three heads are well preserved, a fourth survives only as a fragment (Figs. 15-16). However, they are believed to belong to the original southern portal which has been enlarged without ornamentation. The present situation as well as the probable original positioning of the lion sculptures place them all in marginal positions: in the liminal zone of the church. 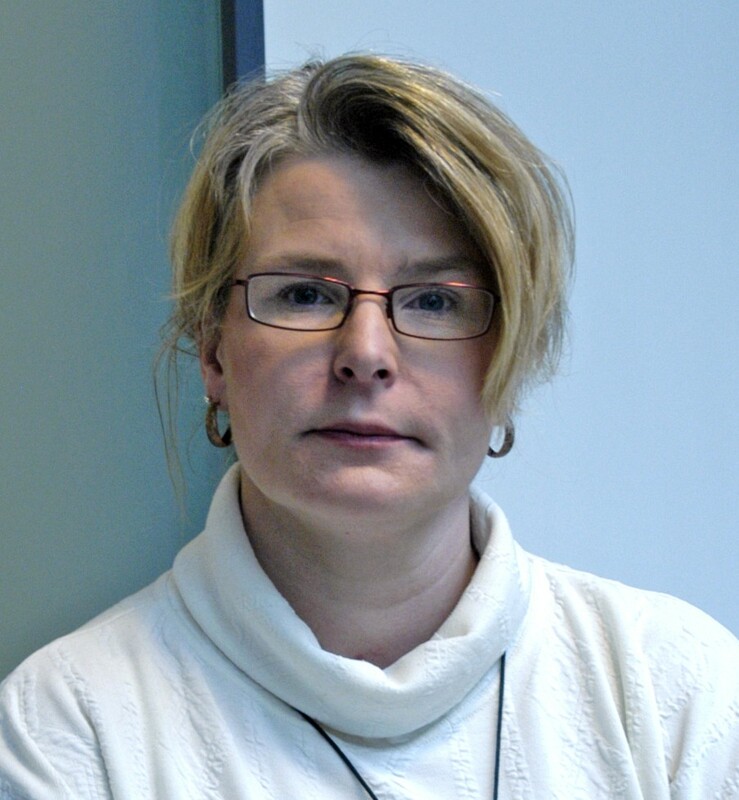 The concept of the liminal zone has been developed by Margrete Syrstad Andås, as a refinement of the widespread use of the “margin” as a term. The liminal zone is the border of the Holy space of the Church building, and as such is important, both in a liturgical and a ritual respect. This in turn explains why portals, windows and the transition between the church wall which is consecrated and the roof which is not, are very often rich in architectural sculpture or even the only place where it can be found in a church. This may also be the key to the interpretation of the sculpture. Fig. 16. Værnes church, Nord Trøndelag. Fragment, probably from South portal. Photo: Morten Stige. The lions at Værnes are not a homogenous group at first glance. They differ stylistically as well as in material and expression. The heads surrounding the south window make a group, so do the heads of the roof beams while the two portal lions are rather different but stylistically related. Dendrochronological dating shows only 6 years between the roof of the chancel and the eastern part of the nave. This indicates rapid building and a short timespan between the two portal lions. 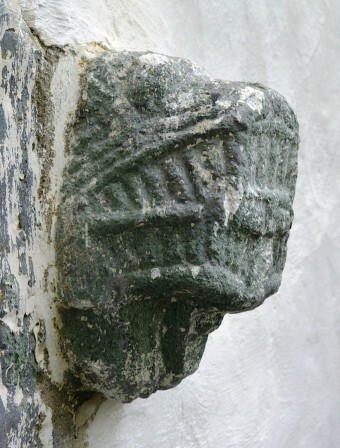 On stylistic grounds however the portal sculpture is dated some 10-20 years prior to the chancel roof from 1143. The roof of the nave was completed in 1161 which suggests a 30–40-year timespan between the chancel lion and the lion heads in the roof construction and the possible south portal. Though there is no unity in style, it is likely that the sculptures form part of a single concept. Fig. 17. Værnes church, Nord Trøndelag. Beam stop, nave roof construction. Photo: Morten Stige. The lion in the chancel portal is presented above as an example of the punishing lion. It also functions as a guardian lion. That is also a function of the lion in the tympanum of the north portal. However, this lion has a pose which is associated with both the royal lion and the Godhead lion as well. The church was originally built on the initiative of the king, the lion as a symbol of regnum and sacerdotum is therefore relevant. The protruding lion heads of the south window show their teeth aggressively and are primarily conceived as guardians. That is a function which is relevant for the secondary position by the window, but which would be much more prominent if they belonged to the south portal as presumed. Thus the stone lions represent at least four of the lion’s possible roles. What about the wooden lions up in the roof? As they are inside, the role of guardian lions is not as likely. But if their position in the liminal zone towards the ceiling is taken into account it becomes a possibility. One of the lions (Fig. 17. )has a man in the mouth and is therefore also a punisher. Their company is mixed with different fantastic creatures, of which none is positively evil however. On each side of the church a man’s head with hands holding snakes on each side, is a clear picture of vanquished evil. Fig. 18. Værnes church, Nord Trøndelag. Beam stop, nave roof construction. Photo: Kjell Erik Pettersson. Viewed as a group the lions seem to be the guard corps of Værnes church. They are all placed in the liminal zone where the guardian lions belong. Both strength and vigilance through sleeping with open eyes are qualities of invoked here. The lions are in the service of God through their protection of the church. Even the two lions which are depicted in the act of devouring sinners, must be understood in this way. When considered one by one, it is difficult to argue for a positive and unambiguous interpretation of the lions, especially those high up in the ceiling. However, the pieces fit together as part of a program. There are good arguments to claim that the intention behind the lions in Værnes church is more than decorative. It is also most likely that the priests used the lions didactically, be it as symbols of ecclesia universalis, warning against sin or pictures of the power of God. The lion serves all these purposes and many more, which is probably the reason for its popularity in Romanesque art even in Scandinavia. Based on the rich material in the Bible and the Bestiaries as well as the wealth of motifs in Romanesque church art, there are good reasons to argue that the lion conveyed meaning to the average medieval beholder. A pictorial motif like the pair of lions flanking a tree retained its significance even if it travelled as decoration on silk materials. On the other hand, it is reasonable to believe that the decoration of a church both to honor God and the men behind the building was also a motive for having sculpture and paintings made. When found in medallions or friezes along with other animals and hybrids, good or bad, it is quite obvious that didactics was not the issue. Even in that situation a lion is a lion and brings with it all the associations discussed above. The strength of images is such that the beholder is unable to see a familiar image without reading into it some meaning based on parallels. The original meaning could of course be corrupted as the lion motif travelled and it would at least be adjusted to the beholder’s culture and religion. As the same mythic and religious motifs can be found across long distances in time and space, the pictorial traditions are often remarkably stable. There is a very clear line from the ancient Orient, through antiquity to the medieval conception of the lion and its meaning. It is first and foremost a symbol of strength, power and dignity. Those are qualities that are never absent from the image of the lion. Of the twelve lion typos presented above nine are undoubtedly positive, two are ambiguous – the punishing and the defeated lion – and only the satanic lion is definitely negative. It is therefore reasonable to believe that the general association provoked by the image of a lion without a clear context have been positive. If not, it would not have served as a general symbol of God, kings and saints. Morten Stige in an art historian and Cand philol. He is Head of Department, Cultural Heritage Management, City of Oslo. Stige has published widely on medieval church architecture and iconography. He has worked in particular with building archaeology and stylistic influences on Norwegian churches, as well as a wide variety of iconographic themes relevant for Scandinavian material. Berggren, Lars 2015. Utställningen De medeltida lejonen i Lunds domkyrka. Iconographisk post Nr.1 2015. http://ojs.abo.fi/index.php/ico/issue/view/84/showToc (13.06.2016). E.g. 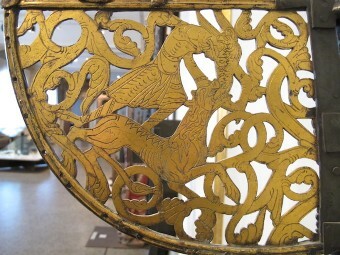 in the Oseberg burial particularly one of the pole heads is lion like. Romanesque art comprises the period between the first Christian art in Scandinavia until the advent of Gothic c. 1200. Allen, Romilly 1887. Norman Sculpture and the Medieval Bestiaries. London. James, M.R. 1928. The Bestiary. London. McCulloch, Florence 1962. Medieval Latin and French Bestiaries. Chapel Hill. Baxter, Ron 1998. Bestiaries and their users in the Middle Ages. Phoenix Mill. Hassig, Debra (ed.) 2000. The Mark of the Beast. New York. KLNM. “Løve”, Vol. 11, 165-176. Sears, Elisabeth and Thomas, Thelma K. (eds.) 2002. Reading Medieval Images: The Art Historian and the Object. University of Michigan. Mâle, Emile 1978. Religious Art in France. The twelfth century. Princeton. 341. Thibodeau, Timothy 2007. The Rationale divinorum of William Durand of Mende. New York. 1. KLNM. “Løve”. Vol. 11, 167. All quotes from the English Standard Version of the Holy Bible. Psalm 104:21 and 1 Kings 13:24-28 are also evident examples of the lion as the tool of God. KLNM. «Physiologus». Vol. 13, 267-268. White, T.H. 1954. The Book of Beasts. New York. 7-9. Fredriksen, Hans Jørgen and Kolstrup, Inger-Lise 1993. Ny Dansk Kunsthistorie, bd 1, Troens kunst. København, 85. The article in KLNM gives a good overview of the diverse use of the lion in Scandinavian, medieval culture. “Løve” Vol. 11, p 165-176. Norway, Denmark, Finland and the great coat of arms of Sweden. Salvesen, Astrid, and Gunnes, Erik translation 1971. Gammelnorsk homiliebok. Oslo. 61. Fuglesang, Signe Horn 1986. 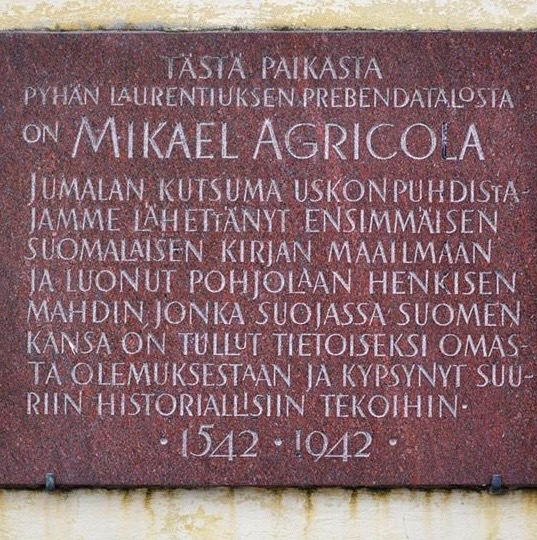 Ikonographie der Scandinavischen Runenstein der jüngeren Vikingerzeit. Zum Problem der Deutung frühmittelaterlicher Bildwerke. Sigmaringen. 203-224. Hohler, Erla B 1999. Norwegian Stave Church Sculpture. Oslo. vol. 2, 57-58. KLNM. “Løve” Vol. 11, 176. Examples are Saint Trophime, Arles and the cathedral of Trani, Apulia. A similar situation can be found in San Lorenzo in Lucina, Rome. Carlsson, Frans 1976. The Iconology of Tectonics in Romanesque Art. Hässleholm. «Discretus non es si non fugis ecce leones» Bond, Francis 1908. Fonts and Font Covers. London. 113. Mâle, Emile 1972. The Gothic Image – Religious Art in France of the Thirteenth Century. New York. 39. See wall paintings in Skamstrup church and Højby church both in Holbæk, Denmark. Chrétien de Troyes. Yvain Løveridderen. Oversatt Olaug Berdal 1986. Oslo. Mariño Ferro, Xosé Ramón 1996. El Simbolismo Animal. Madrid. 280. An alternative interpretation is the lion as attacker of the tree of life. Kolstrup, Inger-Lise 1989. Munkebraurupfontens udsmykning. Romanske stenarbejder 4. Hikuin. Højbjerg, 139-155. The Madonna from Biri, Oppland has been seen as an example of St. Mary overcoming diabolic lions. KLNM. “Løve”. Vol 11, 176. KLNM “Djurkretsen”. Vol 3, 124. The oldest Romanesque example is painted on plaster in Övraby, Scania (c 1150). KLNM. “evangelistframställningar”. Vol.4, 64-66. Other examples are Barlingbofonten, Gotland and the Nes frontal, Bergen. Salvesen, Astrid, and Gunnes, Erik translation 1971. Gammelnorsk homiliebok. Oslo. 60. One stone head is so damaged that it is only an assumption that it was a lion like the three preserved heads flanking the same windows. 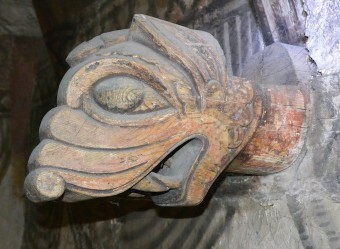 The 39 preserved heads of the roof beams are too stylized to be positive identifications, but 10 have features that can match the type of a Romanesque lion. Syrstad Andås, Margrete 2012. Imagery and ritual in the liminal zone. A study of texts and architectural sculpture from the Nidaros province c. 1100-1300. Copenhagen, University of Copenhagen, Faculty of Theology. Report from Terje Thun, NTNU. 18.11.2015. Hauglid, Kjartan (in print). Bygningsskulptur i stein og tre. Værnes kirke. Stige, Morten and Pettersson, Kjell Erik (eds.). Stjørdal.